Des Moines has been called “the Hartford of the West” due to the number of insurance companies headquartered there. The Principal Financial Group, EMC Insurance Group, Fidelity & Guaranty Life, and Wellmark Blue Cross Blue Shield are just a few of the companies that call this Iowa city home. Other major corporations such as ACE Limited, DuPont Pioneer, and Wells Fargo also have large operations in or near the metropolitan area. In addition to insurance and finance, other big employers include the government, manufacturing, trade, and healthcare services sectors. The cost of living in Des Moines is 85.9 which is under the national average of 100. Housing is the main factor in the lower cost of living, scoring 71 out of 100. The median cost of a home is $132,500 compared to $216,200 for the US average. Moreover, the median household income of $60,011 is slightly above the US average as well. With all these promising statistics related to flourishing business and lower costs, it might be inferred that residents of Des Moines are all flourishing too. However, that’s not always the case. There are always those who do not fare so well financially. Often when folks start to depend on credit cards to make up the shortfall between the money coming in each month and the bills to be paid, debt can start to grow. Or sometimes it’s an unexpected expense like a broken water heater or medical crisis that upsets the financial equilibrium. If you’re experiencing difficulties, you’re certainly not alone. But the good news is, there are ways to change this worrying situation. If your debt is substantial and you’ve decided it’s time to do something about it, there are a number of ways to go about it. You could research getting a loan to consolidate your debt. Debt consolidation could help you save on interest and simplify your payment schedule. Instead of paying multiple bills to multiple creditors, you make one payment a month to a debt consolidation company or other lender. If you can secure a debt consolidation loan at a reasonable interest rate, you could make debt resolution less stressful. To get a decent interest rate, you’ll need to put up high-value collateral, such as your house or your car. If you don’t have assets or don’t want to use them, you may be able to get an unsecured loan. It’s less risky, but it could lead to more debt in the long run due to higher interest rates. This last point is important. If you keep using your credit cards, but don’t pay the entire balance each month, you’ll end up with one additional creditor on your list and be even deeper in debt than before. If consolidating your debt makes sense for your financial situation, and you can check all the boxes mentioned above, the best time to apply for a loan is right away. If you’re currently paying compound interest and late fees, the longer you wait to find a reputable debt consolidation company, the more debt you’ll have. Freedom Debt Relief has Certified Debt Consultants available to advise you on the various types of debt-clearing strategies. Call 800-910-0065 for a free debt evaluation and find out if debt consolidation would work for you. Around 80% of US residents are in debt today from mortgages, medical bills, student debt, car loans, and credit cards. However, Des Moines and other Iowa cities have the lowest average credit card debt at 26%. This is less than the national average of $6,354. 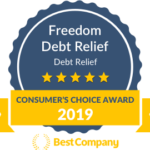 Freedom Debt Relief has been helping consumers get out of debt since 2002 and has one of the best reputations in the business. If you’re tired of worrying over mounting debt, call 800-910-0065 and speak with one of our Certified Debt Consultants to find out about available debt-relief methods. It’s never too late to become debt free. Take the first step today.